Milton, ON — Harvest Series action continued Thursday (Nov. 8) at Woodbine Mohawk Park with sophomore trotting colts and geldings in action. 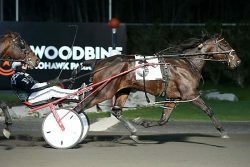 Johnny Bravo coasted to a pillar-to-post victory in the second round of the Harvest Series at Woodbine Mohawk Park. New Image Media photo. Johnny Bravo went coast-to-coast on the front end to score the victory over six rivals in the lone C$17,000 division. Jean Bernard Renaud steered the gelded son of Johnny William to victory for trainer Paul Walker. All seven competitors in Thursday’s second leg had competed in last week’s first round and many were looking to rebound after miscues and poor performances. Johnny Bravo posted fractions of :29, :59.1 and 1:28.3 before trotting home in :29 for a 1:57.3 victory. Eddy finished second by 1-1/4 lengths after a two-hole trip, while leg one winner Charlie Ona Harley was third. Owned and bred by Paul and Julie Walker, Johnny Bravo is now three for 11 in his first season on the track and has earned C$37,450. The clocking of 1:57.3 shaved a fifth of a second off his previous best. Johnny Bravo paid $5.50 to win. Renaud and Walker teamed up for a second win on the card in the evening’s sixth race with 4-year-old gelding Just Jewel, who trotted to a 1:57.2 victory at odds of 6-1. The Harvest Series was open to Ontario sired 3-year-olds, who were non-winners of C$30,000 in 2018 as of Sept. 30. The C$43,900 Harvest Series final for sophomore trotting colts and geldings will take place next Friday (Nov. 16). Live racing continues Friday evening (Nov. 9) at Woodbine Mohawk Park. Post time is 7:10 p.m.
Next Article » Updated ARCI Model Rules committee agenda and materials.